One of my favorite parts of completing my Doctorate in Psychology was having the opportunity to do intakes of incoming clients in various settings. Hearing people’s stories offered a fascinating glimpse into the human experience and afforded me a series of small windows into the events and relationships that form personalities and psychological functioning. What has always fascinated me about people and initially lead me to pursue doctoral training is the same thing that I appreciate most about people now: We all have a story to tell. It’s funny sometimes how little we know about each other. We can spend hours with people at the gym, in our jobs, as parents at school functions and still know next-to-nothing substantive about each other’s backgrounds and histories. What’s YOUR story? If you were going to an intake meeting where someone asked you to talk about yourself and the events and relationships that have formed who you are today, what you would you say? What have been the turning points in your life? Which relationships have mattered most in the formation of how you relate to those closest to you now? What successes and failures have created your current outlook about the possibilities for your future? Intentionally thinking about our own stories from time to time can help us get a grip on why we think, react, and behave in the habitual ways we do. Moments of focused self-reflection about where we came from and how we got here can help us question our relationship patterns and challenge our notions of our future. Ultimately, the goal is to allow for growth and development, both of which imply change. Ever had a moment with someone you’ve known for a long time where you find out a significant bit of information about that person (maybe that her mother died suddenly when your friend was just five), and you suddenly have an entirely new appreciation for your friend’s personality quirks? Ever wonder why your boss is so darn cynical sometimes, only to find out that he spent his teen years in foster care with an alcoholic parent? Perhaps your responses to these people change when you know more about their story. So what’s YOUR story, and how has it formed who you are? 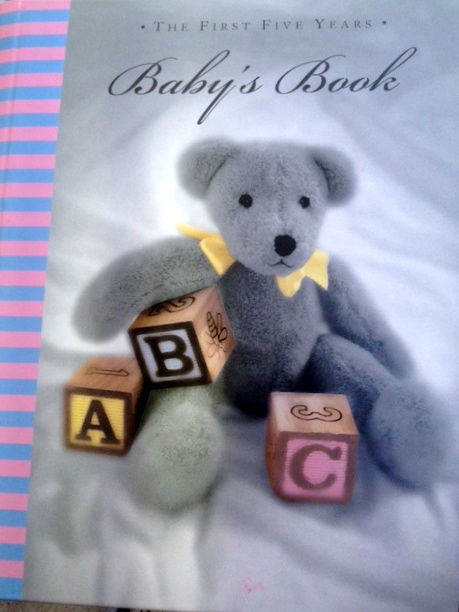 We often have Baby Books, with moments in time documented by others. Somewhere along the way, the stories told about us tend to become us. What are the pivotal moments and formative relationship patterns that make you tick now? Do you let your history dictate your actions now? Have you ever thought about how you can control the effects of early experiences and make changes so you can be unencumbered by them? You are shooting for a one-rep-max lift or you are practicing your tennis serve. After a number of failures, you begin to get frustrated. Because you are trying to be more focused on your thought processes, you realize that you’re thinking about how your older sister could probably do this better than you can. After all, she was always so much better at learning new sports–your dad loved to joke about that at family gatherings. Instead of allowing this line of thinking to unravel in your mind, how about stopping it dead in its tracks? As soon as your sister pops into your mind, remind yourself immediately of a major success in your life, preferably one you’ve had to work hard to achieve. Eventually, with enough practice, you can just say the word “success” out loud and that will be enough to derail your thought process. Or you might remind yourself how your childhood experiences with your sister actually have nothing to do with your success on the court or in the gym today (ultimately having a catch phrase/mantra like “be your own person” should suffice to counter the old thoughts). Of course, the effects of such awareness and thought restructuring won’t be immediate. People often seek ongoing therapy for these purposes; change takes time. But we’re in this for the long haul, so we might as well start today. There’s plenty you can do on your own. Acknowledge your past, consider its effects on your present, and learn to take control of the moments when your story takes over, but you realize you’re not the author. Your revised draft just might take, and it could include a more awesome version of the you somebody else wrote about. What is your perspective on stories that shape you in a positive way? First off, call me Allison! Your question is a great one. I think in general, when we have aspects to ourselves and our stories that are positive and promote our happiness, success, and growth, then we should be thankful for those and tackle the things that need work. However, there are times when “positive” stories can be maintained without substance (e.g., if you were always told you were “special” by your parents, so you don’t feel the need to put much work into yourself, this can become a problem in a different way). I think your question is asking about truly positive parts of our story, and those are just great! Don’t fix what isn’t broken!